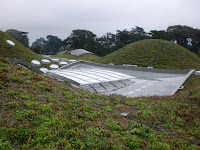 For my birthday I wanted to go to the Exploratorium, but there were no tickets left for the Tactile Dome, so we went to the California Academy of Sciences instead. It was an interesting museum, although I was a little disappointed overall. By "sciences," it basically means "a little bit of everything," LoL. Nothing really science-y in the traditional sense. More of a nature-and-animals thing. Lots of taxidermy animal exhibits. 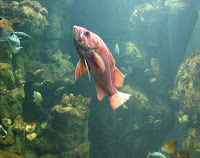 There was quite a large aquarium, but it was sadly un-educational. Most of the tiny plaques which usually show a picture of a fish, its genus and species, and some facts about it were crappy. Well, kind of. A lot of them were actually tiny LCD screens, but a vast majority of them did not provide accurate pictures of the creatures. For us, who both enjoy a good museum and an afternoon learning, it was pretty pathetic. At a few exhibits we were completely dumbfounded at which fish was which, or even where a few frogs were (since we didn't know what color or size they were supposed to be). Still, it had some interesting things. They hav e one of the world's best "living roofs," meaning they have like a hectacre of plants growing up there. Not in like a greenhouse, but with soil and stuff on top of the roof of a four-story building. Nothing with lovely blooms or anything, but the novelty of the concept was neat. They also have a planetarium and a 3D theatre (which was featuring a Bug special), but passes for both were completely gone by the time we tried to get them. I don't t hink we missed anything too great... I mean, I've seen the A Bug's Life special at Disney's Animal King dom, and we've both been to the planetarium at IRSC in Fort Pierce. We did wait in line for about twenty minutes to see the Rainforest, which was a giant ball taking up a good deal of atrium space. It was four floors, and a complete representation of a tropical rainforest biome. Butterflies, birds, and plants are everywhere, and there are multiple air-lock doors to make sure there are no butterflies getting out. Additionally, on each level they have more animals in cages/displays to represent the natural life in different rainforests - they featured the Amazon, Costa Rica, Borneo, and Madagascar. There were additional exhibits, but nothing really exciting, basically some advertisements for global warming and carbon emissions. And an Africa that included penguins.